Sports are activities involving physical exertion and skill in such areas as strength, speed, stamina, and dexterity in which an individual or team competes against another for entertainment of the participants or an audience. Sports that occur in or on the water are called water sports. There are different types of popular water sports around the world. Swimming is the act of moving through water by using the arms, legs, and body in motions called strokes, such as the backstroke, breaststroke, and crawl. Competitive swimming is one of the world's most popular sports. Diving is the act of plunging into water, usually off a diving "board." People dive competitively by performing airborne acrobatics before entering the water. Surfing is the act of riding on waves. Traditionally, people surf by lying, kneeling, or standing on a surfboard; however, they may also surf with just their body (bodysurfing), or with a sail attached to the board (windsurfing). Competition takes place wherever waves are ridden, from Hawaii to indoor wave pools. Surfers are judged based on the wave's size, the distance ridden, and the quality of maneuvers. In addition to preventing injuries and deaths, ocean lifeguards may enter surf lifesaving competitions, a surf sport that helps participants develop and demonstrate their lifesaving skills. 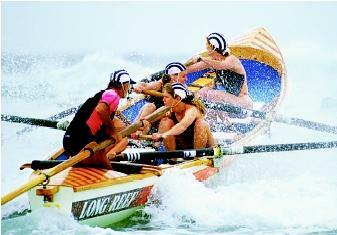 These athletes compete in the women's surfboat race at the 1995 New South Wales Surf Lifesaving Championships along the Australian Gold Coast. over different distances in a straight line. Slalom races are timed competitions held on a rapid river through gates suspended over the water. Rowing is a method of moving a boat through water by using oars. One of the world's most honored rowing competitions is the Henley Regatta that is held annually on the Thames River near Oxford, England. Fishing is the act of catching fish for sport or food. Competitions and tournaments focus on specific game fish, such as trout, tarpon, and bass. Competitions include cash awards and prizes for various categories, including biggest fish caught, first fish caught, and most fish caught. Sailing is the act of moving across water in a vessel powered by wind. The main types of competition are closed-course (small lakes or inshore waters), coast (large lakes, inland waters, or offshore), and ocean. In ocean racing, competing vessels navigate over open sea. The America's Cup Race is an international yacht race in which crews compete while representing their home countries. McManners, Hugh. Water Sports: An Outdoor Adventure Handbook. New York: DKPublishers, 1997. * See "Recreation" for a photograph of a wakeboarder executing a flip. * See "Transportation" for a photograph of a sea kayaker.